Popping a bottle of champagne that has been stored at 20 degrees Celsius (something one really ought never do) ejects a fleeting "mini-cloud" colder than ice and blue as the sky, awestruck scientists said Thursday. Their research, using a super-high-speed camera, revealed a phenomenon never before seen, the team reported in the journal Scientific Reports. 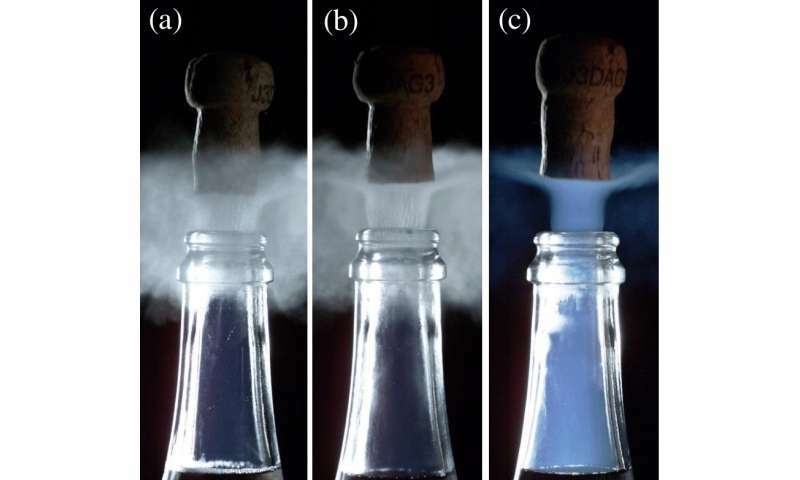 When opening bottles at 20 C, "we observed a bluish cloud that was totally unexpected," said study co-author Gerard Liger-Belair, a professor at the University of Reims in France's Champagne region, where he studies bubbles and foam. 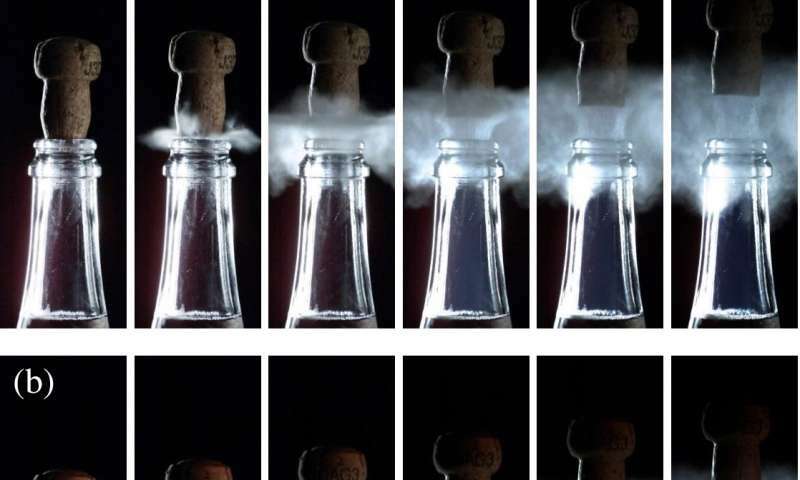 Bottles chilled to six or 12 degrees Celsius (42.8-53.6 degrees Fahrenheit)—release a grey-white fog when opened, a better-known phenomenon that occurs when gas gushing from the bottleneck expands as it escapes from the higher pressure inside. When this—a process known as adiabatic expansion—happens, the temperature of the gas plummets and condensates to form the whitish fog familiar to those who enjoy clinking the occasional flute. The recommended drinking temperature for bubbly is 8-10 C.
At 20 C, the study authors found, something strange happens. There is no white cloud, but rather a fleeting blue plume which starts inside the bottleneck. The team used cameras that can take up to 12,000 pictures per second to observe the first thousandths of seconds after a cork is removed. "Bottles at 20 C were under such a pressure (in the order of eight bar) that the adiabatic expansion allowed the temperature of the escaping gas to plummet to a glacial temperature of minus 90 C (minus 130 Fahrenheit)," Liger-Belair told AFP. This is colder than the freezing point for carbon dioxide. The ambient pressure at sea level is about one bar. "The bluish cloud forms when the CO2 transforms into miniature particles of dry ice which reflect the ambient light," explained the researcher. "This blue cloud has the same physical origin as the blue colour of the sky. Is that not extraordinary?" The blue fog is not visible to the naked eye as it lasts only about two or three thousandths of a second. Earth's sky is blue because tiny molecules in the air scatter blue light, which has a shorter wavelength and higher frequency, more strongly than other colours. The finding has no implications for the way in which we make or consume bubbly, said Liger-Belair. "It is simply a beautiful physics experiment done with a familiar product. Who would have thought that in a few milliseconds, we would find such extreme conditions during the opening of a bottle of champagne?" The science of champagne fizz: How many bubbles are in your bubbly?